This week, the FRESHFARM FoodPrints program at School Within School was awarded a significant grant of $15,000! This support is crucial to continuing our FoodPrints “in-school field trip” model at SWS. The grant was awarded was a School Garden Grant from the Office of the State Superintendent of Education (OSSE). 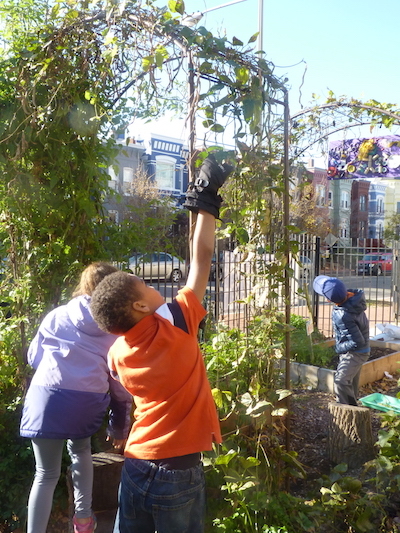 The broad vision of the FRESHFARM FoodPrints program is to integrate learning about healthy eating with the DCPS, Common Core, Next Generation Science, and OSSE Health Standards, so that children’s attitudes towards and willingness to eat nutritious, local foods can be changed while academic goals are met. Maintain the successful model of FoodPrints as an in-school field trip experience for all grades, where students not only have lessons both in the garden and in the classroom but also cook and eat a healthy meal together. Begin composting food waste from FoodPrints classes, so that students learn to turn to the compost bin regularly, not just on their FoodPrints classroom days. Begin studying permaculture using the extra spaces around the school. We look forward to continuing to providing students with exciting, engaging and joyful experiences to nourish their minds and bodies, while integrating our garden into grade-level standards in science, social studies, math, ELA, and health.